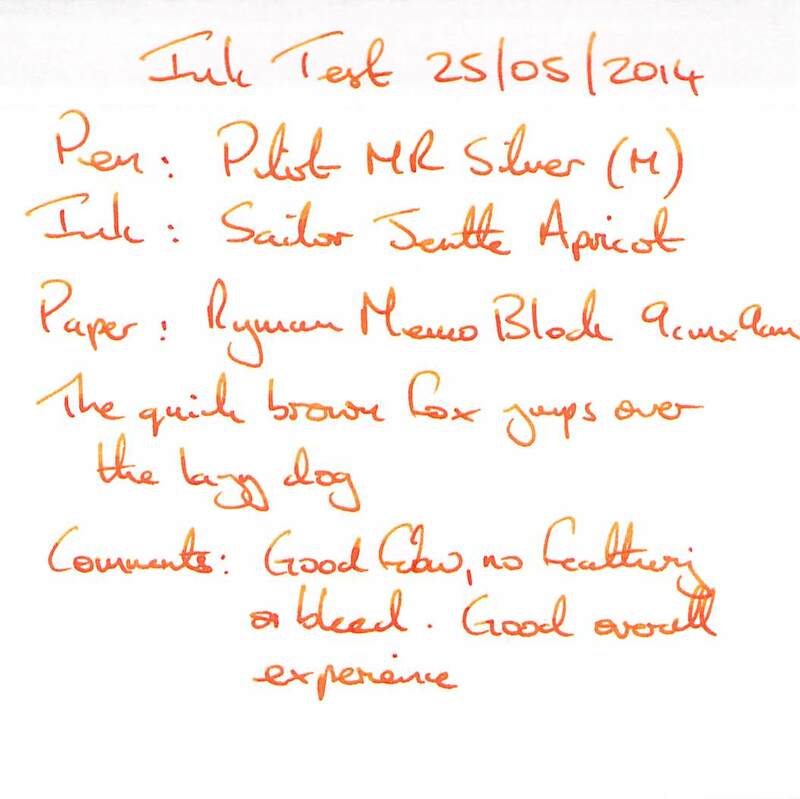 The first of this block of four ink reviews has no special backstory. 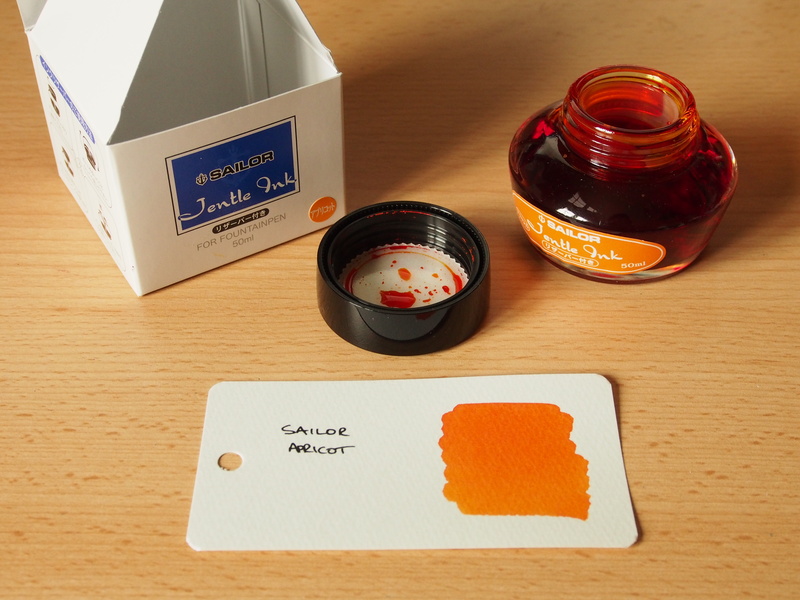 I saw other reviews for Sailor Jentle Apricot, and thought I would give it a try. It cost £10.80 from a UK supplier, which for 50ml I would consider “mid price”. The box is functional. Most of the text is in Japanese, although the pictorial instruction on how to use the filling system are simple enough to understand. The thick, heavy, squat, glass bottle is also functional although its too early to tell if the filling system (designed to get to the very last drop) works as well as intended. The neck of the bottle is nice and wide. The label has the make in English, but not the colour of the ink, but the glass is clear so this is relatively easy to check. 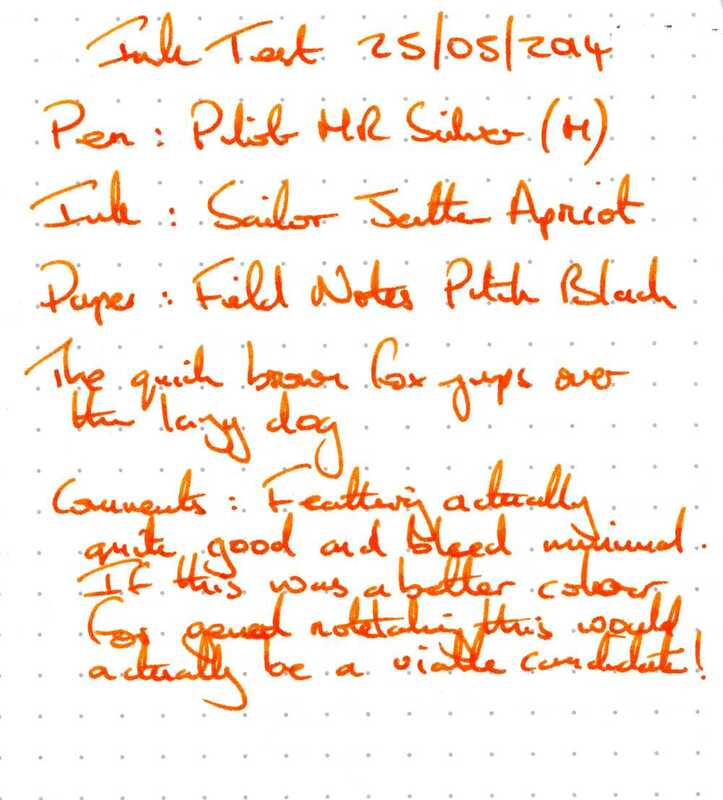 The ink itself has no water resistance – in fact there was almost no staining on Rhodia paper after 10 seconds under running water. Text was also illegible after a few drops of water. The converse of this is that cleaning was easy. Drying time was quick – around 15 seconds. The writing says it all really. 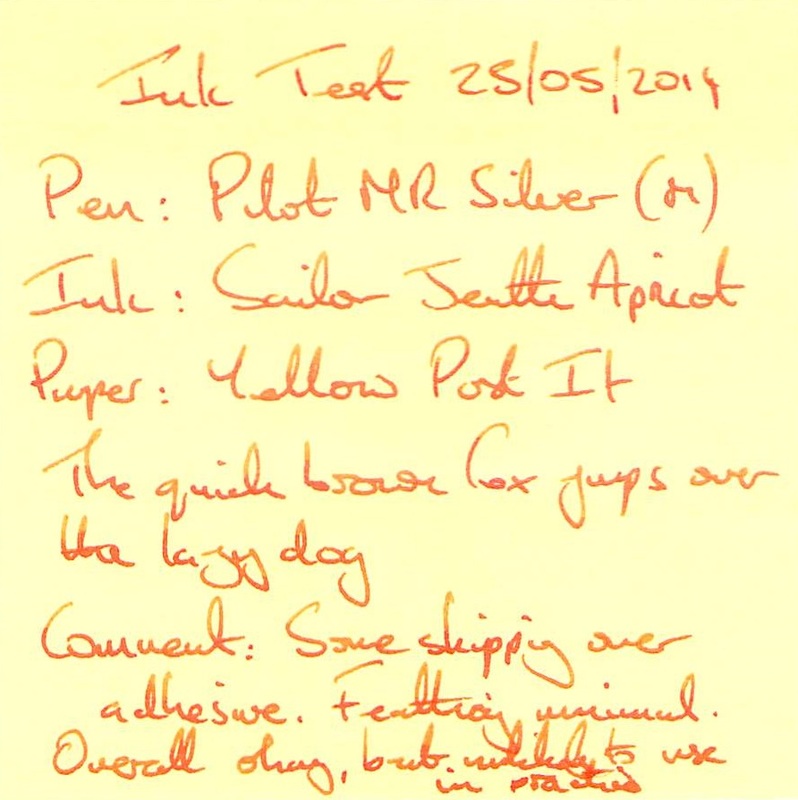 This ink is a pleasure to write with – if you like the colour it’s a good option. Straight out of the nib it looked like a true apricot colour to me, but on drying it went slightly darker. 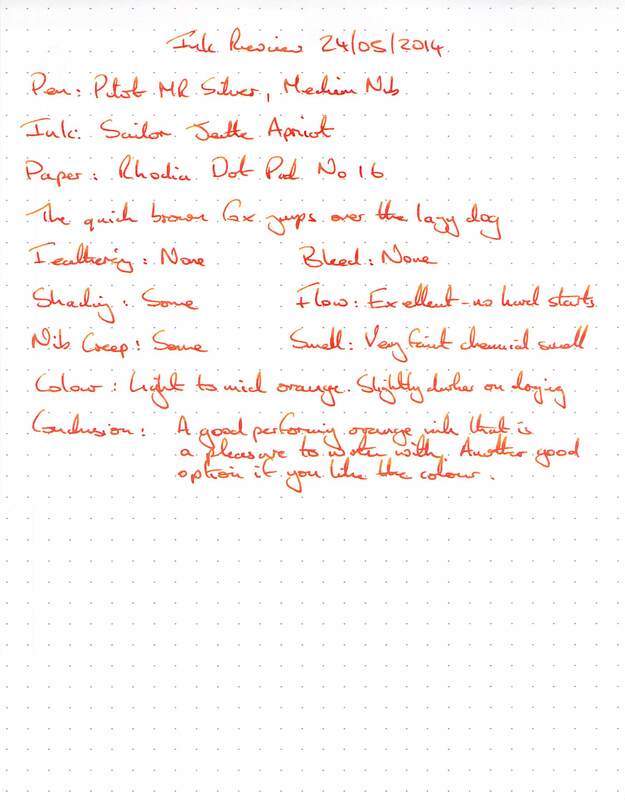 Also a good experience – the ink actually dried a little lighter on the memo block sheet. Flow was hindered by the adhesive / coating, and the poor contrast means this is not a great combination. I was surprised by the lack of feathering. 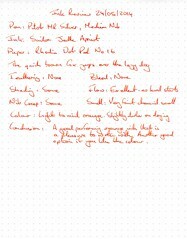 If the colour was more suited to general note-taking then this would be a viable option for use with this paper. The Word card shows shading which ranges from the colour on Rhodia paper at the top, to the Ryman Memo Block at the bottom. This suggests that flow may have been different on the two papers – not that I could sense any difference when writing. 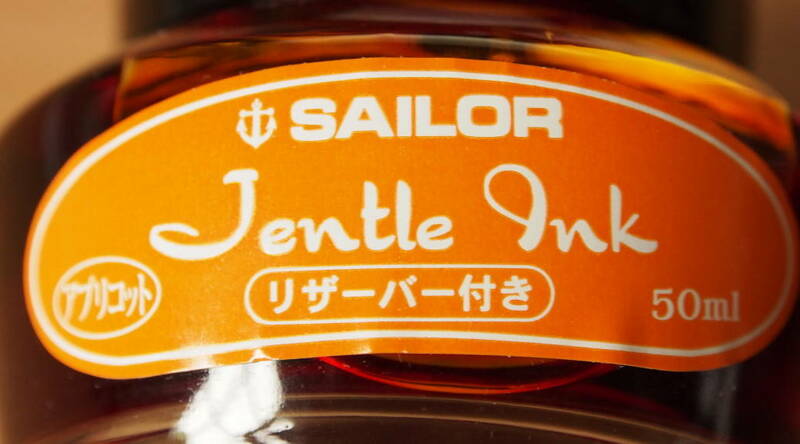 The is an attractive ink which is a good performer and is well behaved. It’s colour really restricts it’s use to markup/highlighting, which means the lack of water resistance isn’t a great issue.